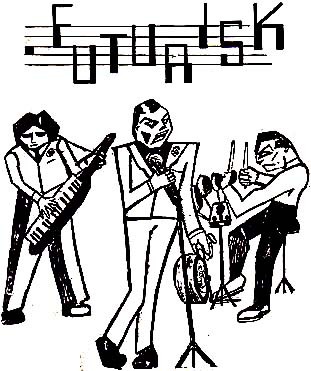 My friend Evan as he was on a minimal synth blog search discovered this band and sent them my way. All I have to say is…. incredible! And what’s even more astounding is that this group formed and played in Florida in the early 80’s, in which I haven’t found any sheer (and interesting) electronic projects that existed until Tampa’s E.N. started up sometime in the late 90’s. If you know of any more synth pop/synth punk projects from Florida like Damage (from Orlando) please let me know. Anyways, more information on this group can be found here and a written account of their entire career (written by their singer himself) can be found here. The download I have posted is a collection of all of their known work, and I definitely recommend it for Los Microwaves, Units, and early Ultravox fans. Enjoy! What I think is so great about American synth punk bands is that there isn’t one specific sound that all the bands had. Futurisk has a really unique style unlike a lot of euro minimal stuff which tends to blend together. Army Now is my favorite track by them. Not sure if you ever checked out the “oh harry your such a drag” comp http://systemsofromance.blogspot.com/2009/02/oh-harry-youre-such-drag-compilation.html it’s full of awesome american synth punk stuff from the early 80s. Yeah you’re totally right. There’s a huge difference even between The Screamers and Nervous Gender. I’ll have to check out that link, thanks again Evan! Damage was an interesting band. I’ve only seen their LP once at a local record store maybe six years ago. Stupidly did not get it. I’ve been unsuccessful in locating anything about them on the web. I had a tape of live material but haven’t located it yet in my boxes of cassettes. Another similar band to look up is Actual Wounds from the early 90’s. Is there a link for a download for Damage and the Futurisk tunes? Oh cool, dude you have to let me copy that cassette if you find it. Todd told me about Damage and now all I want to do is find it.